The current research examined the potential benefit of context reinstatement on the cross-race effect in lineup identification. Participants viewed a series of own- and other-race faces and subsequently attempted identification of these faces from target-present and target-absent lineups. The traditional cross-race effect was found on measures of discrimination accuracy and response bias; however, discrimination accuracy across own- and other-race faces was shown to interact with context reinstatement such that only own-race faces benefited from the provision of contextual information. 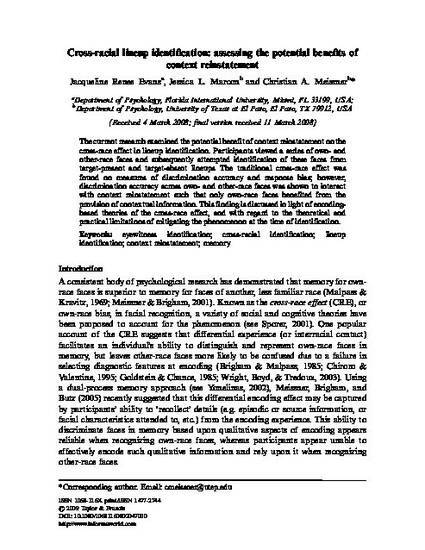 This finding is discussed in light of encoding-based theories of the cross-race effect, and with regard to the theoretical and practical limitations of mitigating the phenomenon at the time of identification.